With each new day my surroundings seem more and more like home, and I take comfort in familiar glimpses of beauty. This photo taken just before dawn on my way down the open hallway to our common kitchenette to make my morning coffee. In the course of the morning, during my visit to the Archives, she brings us coffee, presenting me with a nice expresso cup full of the thick Lebanese variety (café Turque) she annonces, “Surge larri!” (Black coffee without sugar, to which I add a sugar substitute.) But her expression suggests concern that I would really be happier with “surge sharkar” … coffee with sugar! 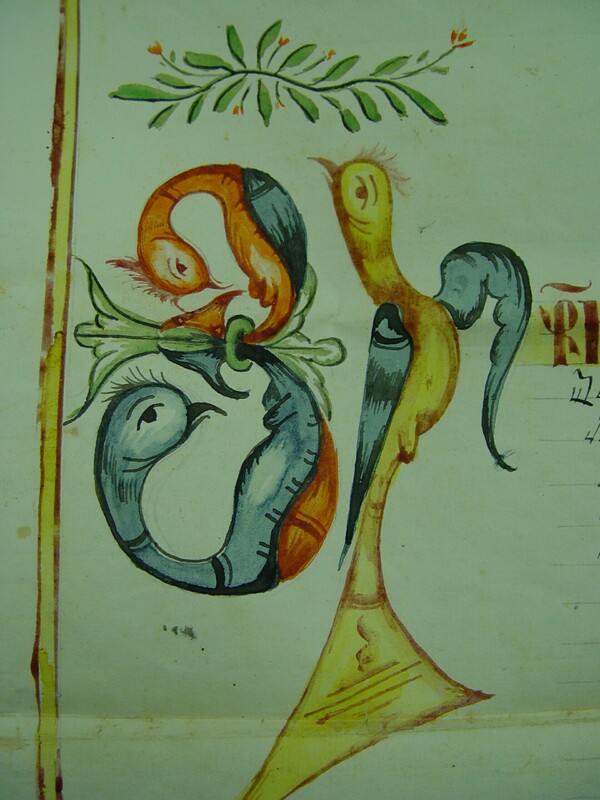 Today, Fr Moses has invited me to visit the Archives of the Catholicosate. 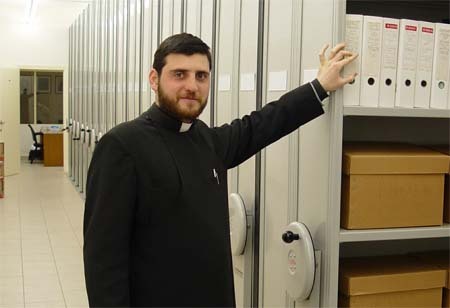 In addition to teaching Sacred Scripture at the seminary three days a week and working on his post-ordination doctrinal thesis, he serves as the assistant archivist for the Catholicosate. 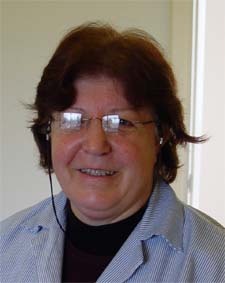 The senior archivist is Fr Yeghishe, who also teaches at the seminary — Classical Armenian, the language not only of the liturgy but also of the first 1000 years of Armenian literature. In addition, Fr Yeghishe is working on a history of the seminary and, yet, despite his work load he has very kindly offered to help me gain a beginning grasp of Classical Armenian. 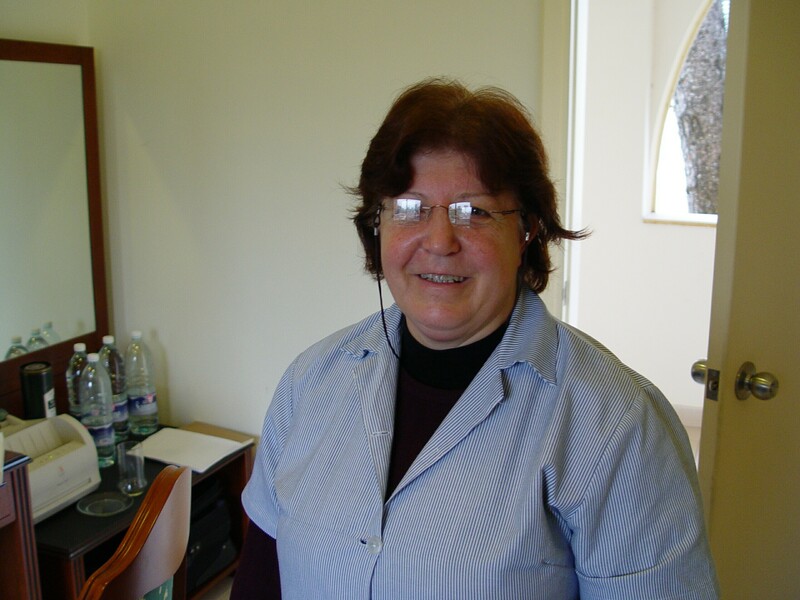 We have started with the Lord’s Prayer and will go onto explore the texts of the daily offices, with tutoring sessions twice a week. I head to the Archives after watching yesterday’s late evening news from Radio-Canada re-broadcast here this morning at 9 a.m. on the local French channel (TV-5). Fr Moses has been waiting for me and is very pleased to show me around. The collection is well organised and stored according to archival standards. Fr. 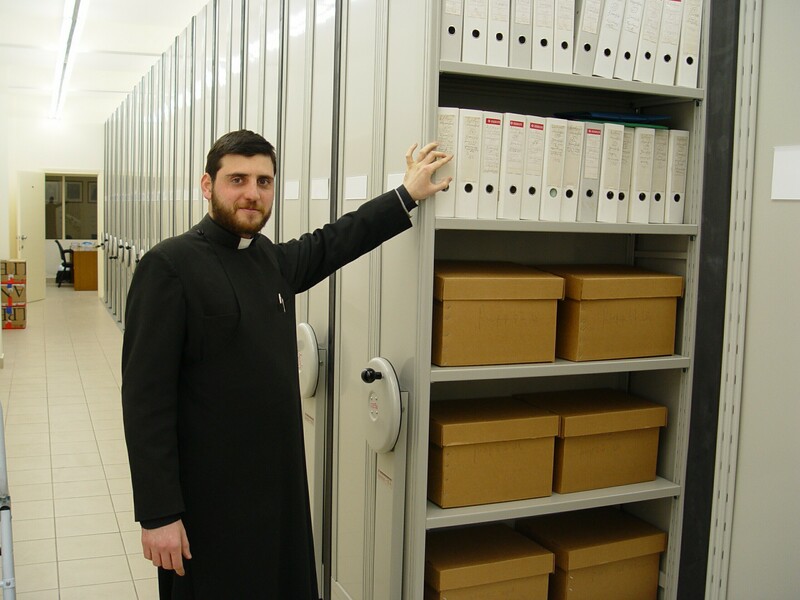 Moses opens the section of the archives where the encyclicals of the Catholicos and his predicessors are carefully stored. 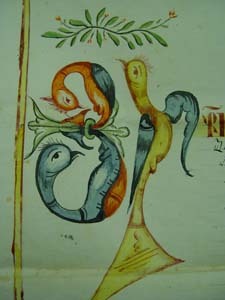 The decoration on the encyclicals is a wonder to behold — pictured here, detail from an encylical from the early 19th century, the initials of Jesus Christ in Armenian “bird letters”. In the course of our visit, Fr Moses explains why there are two branches of Armenian Orthodoxy. 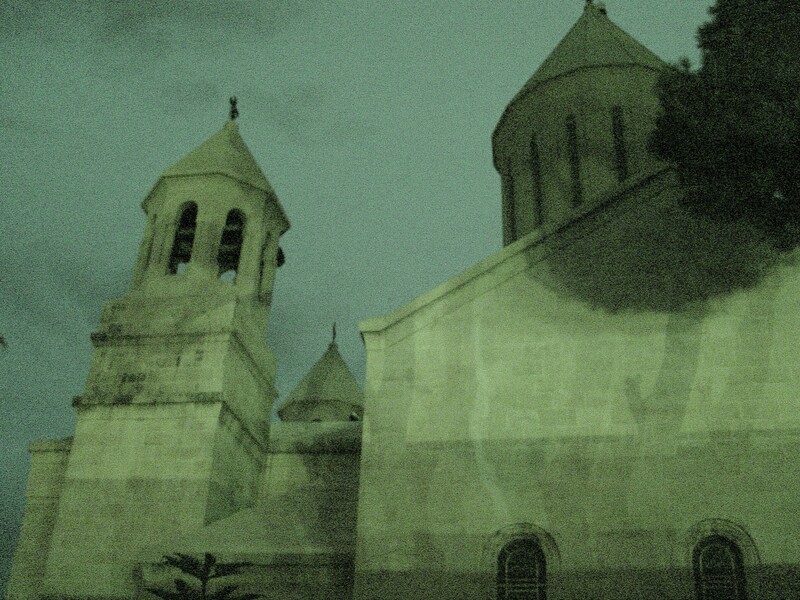 In the 10th century, when central Armenia was devastated by the Seljuks, many Armenians fled and settled in Cilicia (now part of Turkey, formerly the outskirts of the Aremian homeland) where they re-organized their political, ecclesiastical and cultural life. The Catholicos of the day also took refuge in Cilicia; and so the Catholicosate of Celicia was founded. In 1375 it was Cilicia’s turn for disaster, and the Armenian Kingdom there was destroyed. Cilicia became a battleground for hostile Seljuks, Mamluks and other invaders. In the meantime Armenia itself was enjoying a time of relative peace and stability. 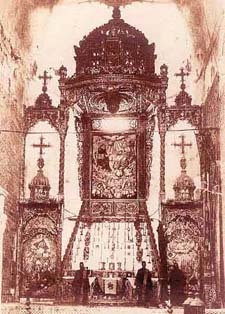 In 1915, fleeing the devastation of Ottoman-Turkish “ethnic cleansing” — the genocide that took the lives of nearly 2 million Armenians — the Catholicos and his people took refuge in greater Syria (now Lebanon and Syria), eventually founding the Catholicosate in Antelias in the 1930s.